Finland is a wonderland country packed with adventure and exciting activities. Based in Kylmaluoma in the north-eastern Finland, known for its dramatic scenery and untouched wilderness. Enjoy an action packed week of canoeing, rafting, visiting a reindeer farm and watching brown bears in their natural habitat. The perfect opportunity to reconnect with nature and spend quality time together as a family, round the campfire. After arriving at Kuusamo airport, we drive 70km to our base near Kylmäluom and check into our cabins. After breakfast, we drive for around 1 hr 30 mins to try out our morning's white water rafting in the Oulanka National Park. After meeting our guides, picking up the rafting gear and practicing our rafting skills, we start our adventure which includes experiencing seven different rapids which are classed from grade one to three. The final rapid, named Harjakoski, is the highest graded rapid of the day and everybody will need to work together to manoeuvre over the rapid although invariably it will provide a nice refreshing splash of water! The raft is large enough for seven adults/teenagers and two children who sit in the middle of the raft. We also walk to an area close by to see some larger rapids. After lunch, we set off to visit a reindeer farm which includes trying out our lassoing skills on a wooden reindeer figure and meeting and feeding these charming animals. Before leaving the farm, we have a break in a tipii, which is a wooden building with an open fire, and where we enjoy some drinks and delicious pancakes. Each evening we can relax in a Finnish sauna by our accommodation and for those who dare, swim in the fresh lake with temperatures are around 15-20 degrees in the summer. The area where we are staying is well known for its walking with over 54 kilometres of marked trails in the area and our guided walk through pine forest allows for a greater insight into the beauty of this pristine region. During the 4 to 5km walk which we do in a loop from and to our accommodation, we are able to learn more about the habitat of the local wildlife and have a picnic lunch around an open fire before returning to our cabins. There are further opportunities for additional walks in the area on the numerous trails or you can simply relax and enjoy the surroundings. Today we take a gentle canoeing trip on the lakes and rivers which is a short walk near our accommodation. We use an open 2 man Canadian canoe to meander along the 10km route that takes us downstream via numerous tributaries and inlets which allow us to pass by the local wildlife on the river banks including birdlife, reindeer and the occasional elk (life vests are provided). There are plenty of well-marked hiking trails for you to explore later today with dinner being cooked tonight on an open fire by your Explore Leader. We head south-east towards the Russian border to Arola where we find a former dairy farm that is well-known for its delicious local food plus something else that is quite exciting. The farm is surrounded by remote woodland and Eero, the farmer, has built several log hides from which you can observe the majestic European brown bears that inhabit the area. Located in a small open wetland area, the hides have been designed to offer the best opportunity to observe the bears - each hide can accommodate up to eight people and is equipped with comfortable viewing chairs and a toilet. Although predominantly a solitary animal, bears do congregate in numbers within popular areas where food is plentiful. As with all wildlife, viewing cannot be guaranteed but in the last 2 years at this time of the year, bears have been seen on 100% of the allocated days at this site. Our last day of the trip includes learning about numerous wilderness skills such as fire making using only the natural elements that are in the woods , orienteering around your surroundings and fishing on a nearby lake as part of a Finnish Wilderness 'Olympics'! The games will also include some exciting and fun activities such as molkky, which is a traditional Finish throwing game where the players try to knock over wooden pins, tandem skiing which involves a group of people strapped on to wooden skis where they have to work together to move forward and Finnish darts which involves throwing darts onto a dartboard that has ten circles with each one giving varying scores. We drive to Kuusamo airport which takes around 45 minutes. The trip ends at the airport. The evenings/nights can be cold so bring a warm jacket/fleece and a raincoat. Waterproof walking boots with a good tread and ankle support. Trainers for relaxing. One main piece of baggage and a daysac for personal items. Bring a water bottle, torch, binoculars, camera, sunglasses and suncream. Local Representative - At your discretion you might also wish to consider tipping your local representative in appreciation of the efficiency and service you receive. We stay in comfortable log cabins within the camping area of the Kylmaluoma Hiking area. The cabins have a kitchen and dining/lounge area which has a single bed plus a bedroom-alcove with two bunk beds (total of 5 beds per cabin although some have six beds). Facilities include; heating, a refrigerator, TV, microwave oven, coffee maker, water heater, electrical stove, toilet and shower. There are also some separate apartments, a restaurant and reception area plus a traditional Finnish sauna which is available every night. Wi-Fi is available in the restaurant and reception. An ability to swim is essential for your safe enjoyment of the water based activities on this trip. If you wish to participate in canoeing then we insist that you are able to swim. 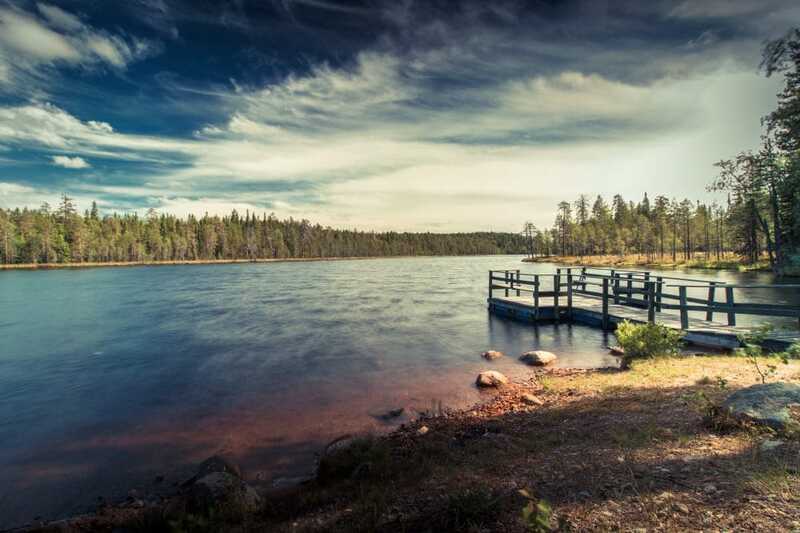 Finland’s great wilderness: The summer months are a truly magical time to experience the wilderness of northern Finland with its endless lakes and forests, carpets of wildflower meadows, wild berries in abundance and reindeer trotting around the campsite. You will be guaranteed the warmest of welcomes as our experienced Explore leaders showcase the best the Finnish great outdoors has to offer with forest hikes, swimming in lakes, taking a traditional Finnish sauna, wood cutting and fire making; white water rafting and a wilderness canoeing trip. We also have the chance to see bears in their natural habitat, heading towards the Russian border. Here we spend the afternoon in a specially constructed hide to watch Brown Bears, one of Europe’s most impressive and elusive mammals. Cabin information: Our base for the week are comfortable rustic cabins which can accommodate up to 5 people per cabin. Each cabin has its own bathroom, TV, fridge and kitchenette, families of 6 or more will be split over two cabins. Please ask our Sales team for further information. Average Age: As a guide we have identified the actual average age of the children who have travelled on this trip over the last 5 years, to help you decide whether it's the right one for your family. The average age on this trip is 11 years old; this trip is suitable for children of all ages from 7 upwards. This adventure has been especially designed with kids in mind. Daily activities are easy and walks can be shortened or extended if needed. With a range of wilderness activities that include white water rafting in Oulanka National Park, visiting a reindeer farm, paddling on crystal-clear lakes plus bear watching, this trip is perfect for families wanting to discover a country and area that is well known for its beauty and with most of the meals and activities all included.